The Brite Bomber Outfit in Fortnite BR. You can buy it from the Cash Store for 1,200 vbucks. Brite Bomber is the name of one of the outfits in Fortnite Battle Royale. Brite Bomber is a unicorn inspired character. keep in mind it does not come with a back bling. It has appeared many times in the Item Shop. Buy from the item Shop. This outfit goes well with Rainbow Smash which is another item of this set. 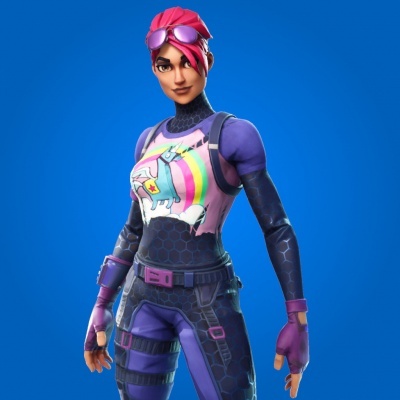 This is the female version of the Brite Gunner Outfit. On October 4th, 2018, a dark version of this skin, called "Dark Bomber", was released to the item shop.